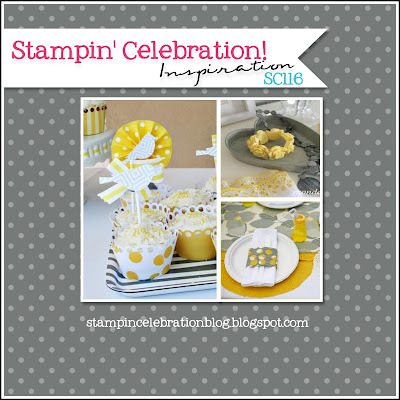 I was so excited to have the new Stampin' Celebration to help inspire me today! I have not been in my craft room for over a month! It was nice to clean it up and start fresh. An inspiration also helped as my creativity is not flowing so well these days. Probably been confined for too long. Anyway, nothing like a deadline and pretty pictures to get one moving again! For this challenge I decided to use Tip Top Taupe and Delightful Dijon as my color scheme. A beautiful combination of colors! I also loved the rosette with the bird so I decided to use that as my focal point. I layered a few elements such as the white jute ribbon that I sponged with Top Top Taupe ink and the scalloped Delightful Dijon cardstock. Can't wait to see what you create with the inspiration provided by Stampin' Celebration! The arrows and the fan flair! Gorgoeus design!! !